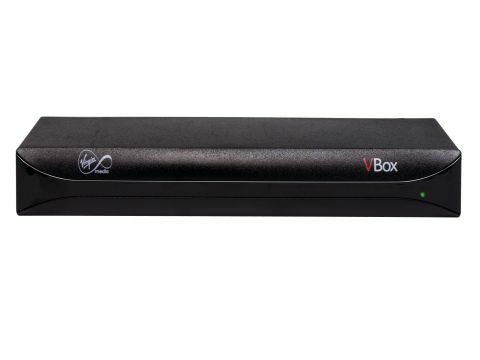 The cute VBox is the first Freeview set-top adaptor from cable TV provider, Virgin Media. It's aimed at non-cable customers looking to take up the brand's quadplay of services - incorporating broadband, phone, mobile and TV - and uses the digital terrestrial television platform (DTT) with its free-to-air TV channels and digital radio stations. The VBox is touted as 'Free TV' to any non-cable TV customers subscribed to its 8Mb broadband and Talk Anytime phone bundle (costing £20 per month), or a one-off £40 charge for anyone taking the broadband service only. The natty unit measures just 190mm by 90mm, which is about the same size as a VHS tape (for those that can remember that antique format), and it can be mounted vertically using the supplied tabletop stand. There's also a TV mount to fit the VBox to the back of the TV set, while remote handset commands are fed to it via a remote receiver cable sat on top of the set. Audio/video connections at the back of the VBox are extremely basic with just two Scarts and a 3.5mm stereo/optical output jack for hookup to a hi-fi or surround sound amp. Features are thin on the ground too, but there's a Virgin Media branded eight-day on-screen TV guide, access to interactive content - via the red button, of course - and a next/previous channel swap button. There's no CAM slot for access to subscription based Top Up TV packages, though. The plug 'n' play installation makes light work of tuning and storing channels, and our test model quickly tunes and stores 50 TV channels and 27 digital radio channels in our medium strength reception area. Pictures from the VBox look robust with bold, solid colours and good smooth levels of detail. It's a solid performance that copes well with weaker signal strengths, and there's barely any picture break-up or dropouts to cause picture concerns. The audio output level from the Scart is lower than normal, which means that you'll need to listen to the TV at a higher volume level, but this is no big deal. Digital audio output via the 3.5mm jack/optical socket is impressive. News dialogue is clean with only a slightly over-emphasised HF to cause us to grumble, and makes dialogue sound too sibilant occasionally. The VBox is a surprising addition to Virgin Media's range of products but offers a solid performance from the Freeview service. It can be purchased separately as a TV add-on but will appeal mainly to those wanting to subscribe to the brand's bundled services that live outside the cable network.